The Ghanaian artist Ibrahim Mahama, 29, has joined White Cube in London. He is the first artist born and based in Africa signed by the gallery. His arrival follows the departure of the British duo Jake and Dinos Chapman, who left White Cube earlier this month after 20 years with the gallery to join Blain Southern, and shows the continuing internationalisation of the White Cube roster. The memory of objects Mahama’s debut exhibition at White Cube, and his first solo show in the UK, opens to the public tonight (28 February). It includes five wall hangings made from the jute sacks which are used to transport goods in Ghana. Their history illustrates the complex trade networks of the global economy and post-independence Ghana. Made in Bangladesh and India, the sacks are imported to Ghana and used to move cocoa beans, one of the country’s leading exports, to the ships which will transport them to international markets. Because cocoa beans are a fragile luxury export, the sacks will move the product first and only once. They are then used multiple times to take crops such as rice, millet and maize around the country for domestic consumption. Finally, they are used to shift coal. Mahama and his collaborators acquire the sacks at the end of their working life, sewing them together to create massive tapestries which the artist has draped over buildings in Ghana such as theatres, museums, luxury apartments, and social housing projects, among others, and abroad (for the 2015 Venice Biennale he covered two external walls of the Arsenale with 300-metre-long hangings). 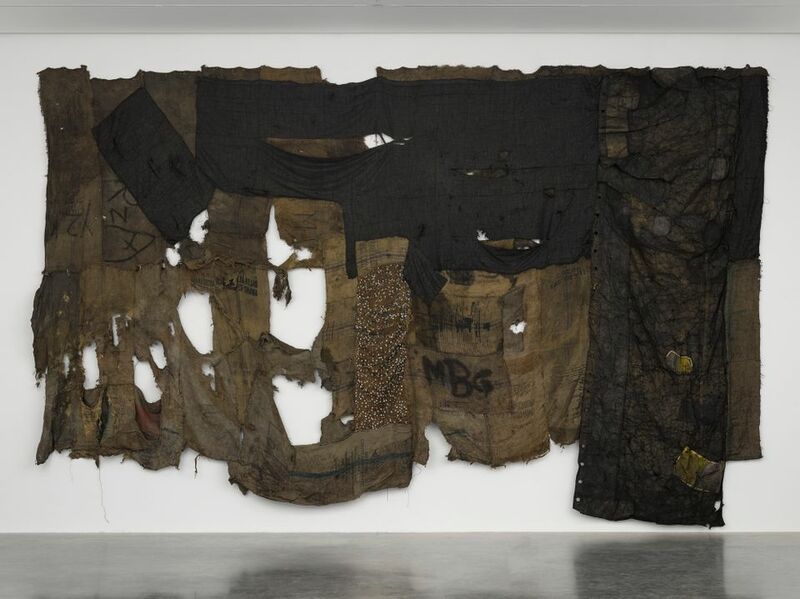 On some of the wall pieces at White Cube, Mahama has also added fragments of the tarpaulin which is first used to cover food transport trucks in Ghana and then recycled to protect metal objects such as engines. 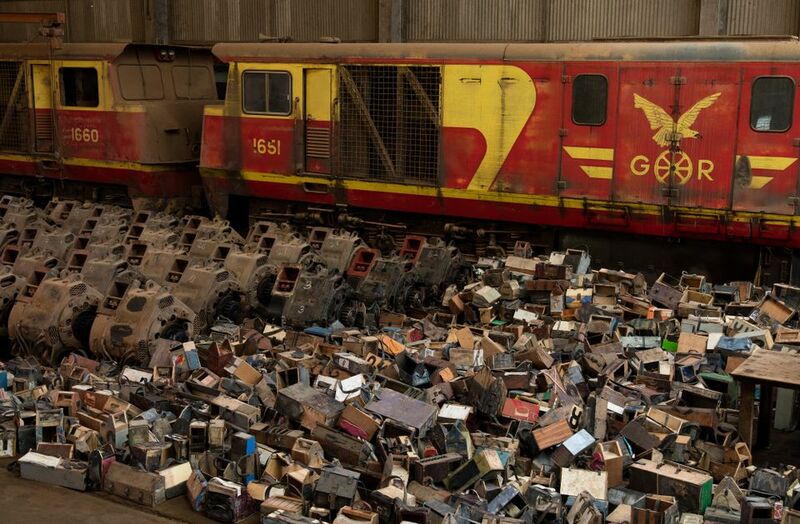 In another tapestry he has added discarded leather seat covers from trains, alluding to the deterioration of the railways in post-independence Ghana. “I’m interested in looking at the artistic and political implications of these materials. What happens when you pick several different objects from different places with specific histories and memories and put them together to form a new object?” Mahama asks. Shoe repairmen Another cycle of work focusses on the wooden boxes used by shoe repairmen in Ghana to hold their tools. Working with a team of collaborators around the country, Mahama has assembled thousands of these boxes, exchanging them for new ones built by his assistants. At White Cube, Mahama has constructed a massive wall out of these boxes, carefully slotting them together with no external supports. Every time the piece is dismantled and re-assembled elsewhere, its “composition will change,” explains the artist. The boxes contain a multitude of objects such as the original tools used to repair shoes and the slippers worn by the repairmen to do their work as well as new objects inserted by Mahama’s assistants, for example, old issues of the Economist magazine. “The wall contains a narrative of post-independence society,” explains the artist, and deals with issues such as political crises and gentrification: many of the boxes were originally made with materials found on building sites or in houses slated for demolition to make way for new developments. “A lot of residues come out of those spaces,” says the artist. “The boxes represent the failure of a system, a failure we haven’t yet acknowledged. The structures of global capitalism shift things such as the cosmopolitan life of the city and the structures that are built around it.” Now they have a new life as a work of art in a high-end gallery. “The potential of these structures when you look at them beyond the chaos and the crisis is also interesting,” says the artist. Also on display are archival photographs of a paint factory set up by the Ghanaian State, then privatised in the 1990s, and later abandoned. Mahama found the images in the factory when he set up a studio there for the shoe box project. Also at White Cube, a two-screen film shows the installation of Mahama’s massive jute-sack tapestries on buildings such as the National Theatre in Accra. 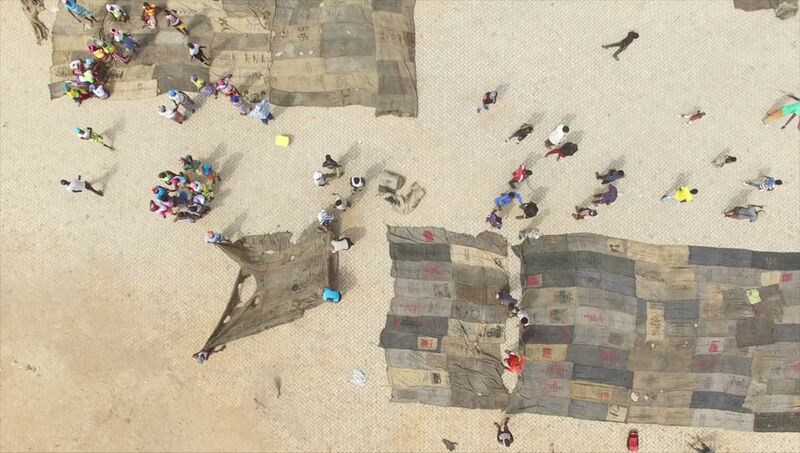 Drone footage surveys the sites from above while hand-held cameras follow Mahama’s collaborators as they laboriously carry the massive objects up to the roof.